The Chief Executive Officer, Alan Johnston, new Chair Michael Quirk, and representatives of the Board of Management of Committee 4 Wagga today met with Acting Prime Minister, Leader of the National Party & local Federal Member Mr Michael McCormack, along with the Deputy Leader of the Nationals Senator Bridget McKenzie (Minister for Regional Services, Sport, Local Government & Decentralisation) and the Nationals candidate for the State seat of Wagga Wagga for the March 2019 NSW Sate election, McKenna Powell. The meeting was held at the site of the RiFL hub and the Stage 3 Industrial Park at the Bomen Industrial Park and also at the Enirgi Power Storage Recycling facility in Bomen. In what was a very positive discussion, the Committee 4 Wagga sought to increase the awareness of the importance of the RiFL and Industrial Park development within the National Party at Federal & State level. Committee 4 Wagga seeks to gain Government support for the adoption of Smart City technology within the new and existing Bomen Industrial Park, linked to the Central Business District and Health Precincts in Wagga Wagga, using technology in addition to that offered by NBN, to provide the City with a ‘point of difference’ in competing with other regional and capital cities. The Committee 4 Wagga sees that we need to take a more proactive approach to adopting Smart City thinking and technology and that Government needs to elevate its focus and immediate investment in order to retain, grow and attract population & business entities to Wagga Wagga and to maximise the benefit from the new infrastructure to be constructed in the immediate future. Committee 4 Wagga’s CEO, Alan Johnston, has engaged with representatives from the City of Adelaide in order to evaluate the potential to implement a solution similar to the very successful Ten Gigabit Adelaide project which is now recognised as an international blueprint and resulted in Adelaide being positioned to become a globally-recognised smart city and capitalise on innovations that will drive significant future economic growth. We need this level of thinking to present Wagga Wagga as the preferred alternative to other regional cities and capital cities and connect Wagga Wagga effectively to the global community, as well as improve the liveability of the city for residents, business and visitors. 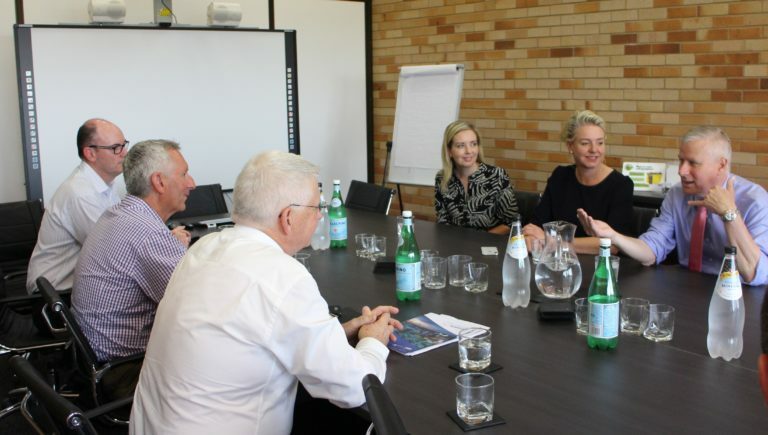 Also raised with the Acting Prime Minister and the Nationals candidate for Wagga Wagga, McKenna Powell, was the inclusion of Wagga Wagga and Albury in the NSW Premier’s recent announcement of a Fast Rail Network Strategy feasibility study to be led by Professor McNaughton. This study is considered to be Sydney centric and misses the opportunity to bring Fast Speed Rail to the major regional centres of Wagga Wagga and Albury. We encouraged the National Party, both at a Federal & State level to promote the need to add into the study a Fast Rail service between Albury, Wagga Wagga and Goulburn, which would then link to the Sydney-Goulburn-Canberra route in the study. This would then align with the 20yr economic vision for regional NSW (linking the southern NSW area to Canberra & Sydney) and be an effective forerunner to the Federal High Speed Rail Melbourne-Sydney project, without having to build a new rail line at this time between Wagga Wagga and Canberra. In relation to the recently announced restructure within Wagga Wagga City Council, the Committee 4 Wagga supports the Wagga Wagga City Council and General Manager Peter Thompson in its reorganisation to again provide a directorate to focus on economic development and growth initiatives. It is essential however, that this Regional Activation Directorate engages closely with Committee 4 Wagga, the Chamber of Commerce and Charles Sturt University who have committed to partnering to ensure there is a co-ordinated one voice collaboration with business, government & community to increase the efficiency, momentum and delivery of economic growth for the City and immediate region.